Update: 2017 data is now available. With Financial Performance Data you can view financial data based on industry averages, with an option to include your own income statement and balance sheet information in the report. What is Financial Performance Data? Financial Performance Data provides access to more than 1000 industries across Canada, including more than 30 performance benchmarks to help small businesses determine how they measure up to their competitors. 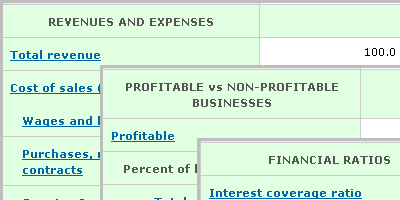 Reports feature the number of businesses in the selected industry, statistics for profitable and non-profitable small and medium-sized businesses that includes net profits and net losses, and detailed financial data on revenues and expenses, industry average's for income statements and balance sheet items as well as financial ratios. Reports are marked with quality indicators that measure of the amount of imputation contributing towards a given value. The reports are representative of all businesses operating within the specified industry and geographic area and earning revenues ranges of $30 thousand to $5 million and $5 million to $20 million in total annual revenues and by profit margin. Note: Data users are cautioned when comparing data from the Financial Performance Data with other departmental data, as differences in the methodology, interpretation and data sources make these comparisons uncertain. The 2017 Financial Performance datasets, distribution by total revenue and profit margin are available as open data on the open canada website. How Financial Performance Data can help my business? Financial Performance Data can help both new and existing businesses to better understand how competing firms operate in their chosen industry. How Financial Performance Data can help new businesses? When starting a new business, one of the most important activities you can undertake is the preparation of your business plan. Financial Performance Data can help you to complete the financial component of your business plan by providing an accurate sense of the cost structure of similar businesses in your industry. By examining the differences in expense categories for businesses within different revenue levels you can get a more accurate reading of expected costs for firms that match your anticipated revenue level. Furthermore, you can project how the cost structure for your business may change as your business grows and revenue levels increase. How Financial Performance Data can help existing businesses? Business plans are not just for start-ups. Revisiting and updating your business plan frequently can help you to ensure that your business is performing optimally, staying on top changing business conditions, keeping tabs on the competition and injecting fresh ideas into your operations. Whether you are putting together a formal business plan or seeking to make an operational decision, the Financial Performance Data can provide insight on the operations of similar small and medium-sized businesses in your industry, from amounts spent in specific expense categories to the general health of the firms in operation. Financial Performance Data also offers you the option of entering data from your business - annual revenue and expense data and assets/liabilities, which can be used to benchmark your small or medium sized business against relevant industry averages. Benchmarking using Financial Performance Data can identify areas in which your business deviates from the relevant industry average, identifying opportunities to make changes to your cost structure that may help you to grow your business. Canadian Industry Statistics presents and analyses industry data on a number of economic indicators using the latest annual data sources from Statistics Canada. Trade Data Online generates customized reports on Canadian and U.S. trade in goods with more than 200 countries. How to create a report using Financial Performance Data?